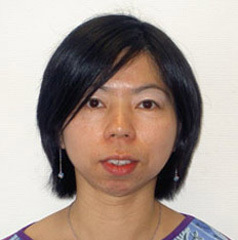 Mei Yuk Wong was born in Hong Kong. She studied theology and then worked as an editor for a Christian organisation for several years. Then, she studied for an MA in Women and Development in The Hague, where she met officials and activists from different countries. After 1997, she felt that her work in Hong Kong had come to an end. She decided on a change of direction by pursuing her creative work. So she came to England and studied at Wimbledon School of Art and London Guildhall University. While making artwork, she started to write poems and was published by Poetry Now. In 2002, she published her first book, Walking in the Clouds, based on her exhibition of photography and embroidered poems. More recently in 2004, she had led a poetry reading event for the Manchester Poetry Festival. She also writes joint poems with other poets. I moved to Manchester in 2000 when I got a job at a Chinese community centre. Before that I had never visited the city. It was a brave decision to come to a strange area without any friends or family. During the first few weeks at work I felt overwhelmed by the complexity of the city and its communities. When I was a student in London, I just enjoyed making art and writing poems. Of course I did worry about my saving but I was simply happier. Working in Manchester seemed like going to war everyday. People were crazy and demanding. I never really wanted to be a social worker. There was endless casework waiting for me to handle. I did not understand why there was so much domestic violence in the city? Can’t men respect their wives and love them more tenderly? Gradually, I made some friends and tried to keep making art and write poems. My job made me realise about the lives of ordinary people, especially those immigrants from Hong Kong or different parts of China. The struggle of their daily lives affected my art and poetry, making it more down to earth. I think they enriched my work. I enjoyed watching movies very much and I went to the cinema every weekend. I also saw various musicals, plays and concerts. In fact, I now find that Manchester is just a like a mini London, as I can enjoy different cultural aspects. In summer 2002, Manchester held the Commonwealth Games. I was one of the volunteers. That was the first time I felt proud of Manchester. I could see how many Mancunians were devoted to the city. There came the hope. I stayed and it’s been well worth it! In 2007, Monkey King had its premier at the Palace Theatre. I was so pleased to see the production and was involved in organising some educational workshops for the play with schools and community groups. It was not just a traditional Chinese legend. In fact, the new production was a fusion of eastern and western ideas. I love it! Much of my work has a strong humanitarian basis. What I have learnt about theology, feminism and art, at various universities, has influenced my poetry. I cannot let myself settle down in a comfort zone and forget the rest of the world. The people that I have encountered have also enriched my life and work. There is so much that I want to create through art and poetry. ‘Hope is on the Way if you Stay’, is a new poem. Basically, I look at my journey from Hong Kong to London, and then from London to Manchester. These nine years seemed to be a period of intensive training in my work and study. I have tried making artwork and writing poetry in spite of demanding jobs. There is so much to write and I cannot put it all down in 40 lines! It is just like a summary of my experiences, feelings and emotions.